Story: Zhang Ning (Xia Yu) is a professional killer, because he needs the money. 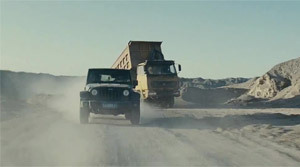 He flees into the Gobi desert with his wife Sun Jing (Charlie Yeung) as he is supposed to be eliminated by the killer Mai Gao (Francis Ng) and his right hand A Nuo (Yu Nan). Zhang's former client wants to see him dead while also making an important piece of evidence disappear, a picture Zhang took. But not only the two killers are eager to find Zhang Ning. Police detectives Xiang Xi (Duan Yihong), Xiaoming (Wu Jing), Jianzhong (Ni Dahong) and Chaodong (Li Zhang) are also hot on his trails. When they finally arrest him, Mai Gao and A Nuo need to find a way to free Zhang. 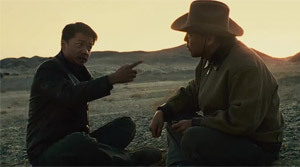 Things eventually lead to a wild shootout in the desert and the killers are successful. However, the policemen immediately go in pursuit since the arrest of Zhang Ning has top priority with the higher ups. Meanwhile, the killers have barricaded themselves in an old bandit hideout and try to torture out the info from Zhang Ning where he has hidden the picture of their client. Several bloody confrontations between police and killers follow. Review: With "Wind Blast" China tries to deliver something similar to a western movie. 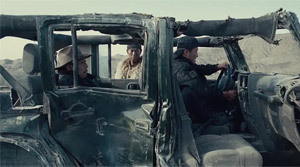 With the small difference that the action flick is set in modern times and has been shot in China's vast desert landscape. This makes the pictures a true experience, also thanks to the great cinematography by Du Jie, who later on should capture no less impressive pictures for "No Man's Land", a film that is quite similar in respect to its setting. But naturally we mainly expect a lot of shootouts and suspense from an action flick/western. You won't get neither of the two, though. Instead, the slow pacing oftentimes maneuvers the movie right into a wall. Accordingly, the good actors can't save the movie either. Especially not since the characters may seem intriguing, but aren't nearly as elaborately written as they would have deserved. First and foremost, "Wind Blast" makes it difficult for us to follow its story at first. The different parties aren't introduced in a classical sense, instead as the movie progresses you have to put two and two together as to who is in what kind of relationship with whom. For impatient viewers this can get quite frustrating. And after it is finally clear that the police as well as the killers are after Zhang Ning, there is nearly nothing left of the plot that deserves our attention. The thin plot thus presents itself as one of the movie's obvious weaknesses. Because the rest of the screenplay merely delivers new and everything but convincing reasons why police and killers are butting heads over and over again. Sadly, the empty spaces within the screenplay aren't made use of by illuminating the characters some more either. When it comes to the characters it needs to be pointed out that they have almost superhuman abilities. Ni Dahong ("The Assassin") is an unbelievably accurate shooter, while Li Zhang shows incredible physical power. 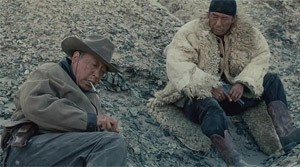 Duan Yihong ("The Dead End") on the other hand has a nearly inexhaustible stamina so that he runs through almost the whole desert on several occasions without taking a breather. Yes, "Wind Blast" can be unintentionally funny at times, especially when it becomes apparent that no one really knows where he is supposed to go next. Wu Jing ("SPL 2: A Time for Consequences") may make a charismatic impression as does the rest of the cast, but he isn't allowed to show his martial arts expertise, except for 1-2 small scenes, and that's a shame. However, the true stars of the story are Francis Ng ("Two Thumbs Up") and Yu Nan (also to be seen in the aforementionted "No Man's Land"). Francis Ng may be an assassin, but there is also a human side about him. And Yu Nan is tremendously neglected by the script, but shows a strong on-screen presence and teases out quite some impressive stuff out of her shallow role. But to be honest, the real star of the film is actually the desert. 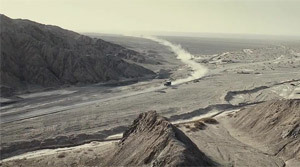 The landscape shots, including many widescreen shots, are breathtaking and wonderful to look at. You often even believe to feel the sand between your teeth, which the wind lashes around. Director Gao Qunshu ("The Message") also deserves some praise for the action scenes. They look really good and are memorable since they are hard-hitting and stand as a pleasant return to practical special effects. The chasing scene in the desert as well as the showdown at a police station in the middle of nowhere manage to stick with you as well. Particularly during the finale the director treads on an unusual path and veers away from genretypical clich�s. If it just weren't for the pacing problems being so omnipresent, since they also become apparent during the action scenes. What's especially bad is that the shallow screenplay just delivers too little material for the two hours running time, so that you constantly have to endure some rather lengthy filling material until the next interesting action scene kicks in. Consequently, "Wind Blast" isn't really worth a recommendation.